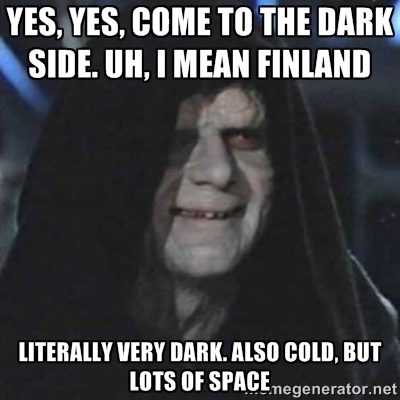 After reading this post, you would probably say, “Fine, the Finns are shy and reserved. What about it? Just leave them alone”, but I just can’t stop feeling amused about my own experiences and observations of living in Finland , especially after watching this interesting video I came across on Youtube. I am not going to use the word ‘funny’ here because the whole situation described here is for real and is, indeed, a serious matter. But I just can’t help smiling about how true these things are, at least to me. 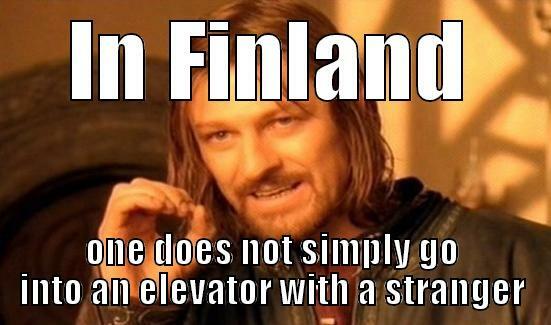 Please note that this post is not an attempt to make fun of the very ‘Finnish life’ I am living at this moment. On a serious note, I live in a building with six floors and each floor has about four apartments. Yet, except for the sound of the elevator, all I hear all day is my own heartbeat. But that happens only when my husband is away. When he is home, the things are different. We Indians are loud and ridiculously society-friendly-people where, sometimes, what is happening inside a neighbour’s house becomes more important than our own life issues. Otherwise, the silence in my building is so unbearable that my ears start buzzing. Wait, is it because of the soundproof windows or I am just beginning to lose my sanity here?? 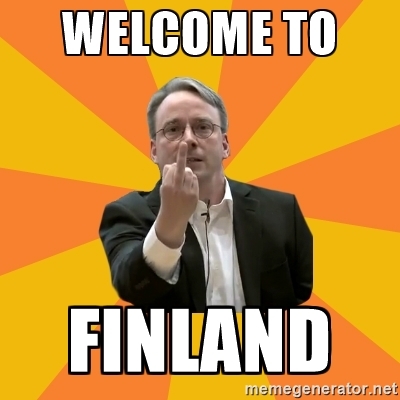 In both the cases, I feel as if I am the only living creature in entire Finland. It’s a completely different feeling when we party, though. You can imagine what happens when about eight to nine Indians are scooped inside a small apartment and having the time of their life like it is their last weekend on earth! What do the Finnish neighbours do then? They remain patient till it’s 11 PM and then they politely threaten to call the police. Apparently, nine Indians sound like thirty Indians getting ready for a war and our neighbours just refuse to believe that nine people can create such ear-splitting noise. But, hey, that is just us, so unfit to live in a place so quiet! So,this puts us back in our silence zone for at least a couple of months. The melancholy sets in and the ‘Tango Finlandia’ is the only option left to do. So, living in Finland is not all about sharing space with just a pretty cluster of melancholic people after all! Or is it the alcohol tricking their nature? Whatever it is, this looks pretty fun to me. On the other hand, it’s been a one and a half years since I moved into this building but the shy ‘moi’ you receive near the lift is all we have managed to extract from our neighbours so far. So it just makes me wonder if this break dance part is for real. On a second thought, it would be dishonest to say that they don’t try. Once a gentleman in my building with a dog tried to speak a few lines about his dog in the elevator but I just royally screwed up. Ask me how? So what happens is, some of us Indians (who don’t own a dog) are not very fond of dogs to be frank. But, mind it, we hate Indian dogs who keep barking all the time and, given a chance, would rip apart you flesh in an instant. I think it’s because we train them to be ferocious in order to tackle theft, robbery and other unpleasant stuff. On the contrary, the dogs here are quiet just like the Finnish people. They just check you out for a while and lose interest within a few seconds. After seeing their quiet nature, I have come to admire them but from a distance and without any physical contact. So, this gentleman was trying to tell me how his baby (read-dog) loves his evening strolls and I just smiled and fled out of the elevator. I should have at least asked what his baby’s name was. How rude of me! Honestly, I didn’t know. I am sure, you too will hate me after reading this. Again, I was strolling in the park one day, and this dog came running to me in joy. There was no leash on him and my basic instinct was to shout and run. Because that is what we (I) do in India before a dog manages to dig his claws into your flesh or bite it off. Still knowing that things are different here, I managed not to run and freeze in the spot with terror in my eyes. The owner was naturally offended. He came to me and said that there was no need to panic as the dog was just checking me out. Sigh! Sigh! Sigh! Thereby, I lost a couple of potential social interactions which could have changed my perspective perhaps. Or maybe not. I just wouldn’t know. The last time spoke to a Finnish neighbour was about a month back when he was very drunk and came to tell us not to cook Indian food. And all this while I thought the Finns really love Indian food. At least the exceptionally friendly girl at my bank told me so. Do you think that was just the ‘bank talk’??? Anyhow, this absolutely does not suggest that the Finns are racists. They are not. Again, I would say, it was just the alcohol speaking. This one is pretty funny though. Don’t you think so? I hope one day I get to post something like ‘How to befriend a Finn’. This is so funny – I’ve been on both sides of this. Once I was out with my dog and he wanted to say hello to a lovely Indian man who was fishing. Unfortunately his response was to yell and wave his hands which in dog speak is come and play with me 🙂 Definitely it takes time for the neighbours to say more than ‘hei’ or ‘moi’ and for sure the dog owners are more likely to instigate a conversation with random strangers than non-dog owners. Hello! It’s so good to meet fellow bloggers from Helsinki. We really love it here and trying to enjoy our stay here as much as we can. I loved this post! It describes us Finns so well 😀 The dog owners speak a lot for people they don’t know. And if they come and speak with you when they have dog it will be safe and kind dog so don’t worry 🙂 (if they don’t speak to you the dog may not like people or the Finn is just extremely shy.) I hope you like living here! Oh too bad about your dog encounters! As you have found, Finns don’t just start conversing out of the blue. I would say that it’s only the dog owners who do this. Thus it’s a pity you are afraid of dogs! I’m not a dog person, so I don’t like it if someones dog comes up to me and it’s not on a leash. But this happens all the time..